"They're as dangerous dead as alive"
Having repulsed the dog pack attack, Fenton and Charles collect wood for the fire they must light to incinerate the bodies of the dead — and so contain the risk of further infection. Description: This is the pathway leading to and from Monsal Head. 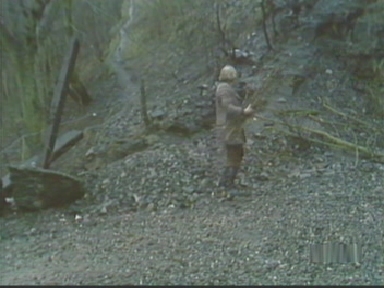 It is almost certainly the route alongwhich cameras and other equipment would have been carried from the crew's "base camp" at the head of the valley. 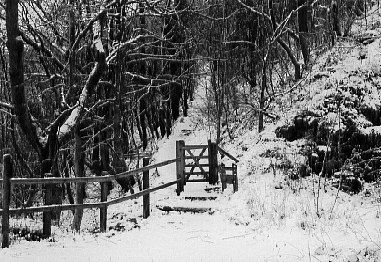 In 1977, little money was being spent on promoting the viaduct as a "visitor attraction" — the new gate, fenceway and improved foothpath visible here is an indication of greater investment in the site today. Where is it? : The viaduct top is accessible from this signed footpath leading down from Monsal Head, and also via a steep pathway from the valley floor. It can also be reached along the footpath adjacent to the barn in which Charles is discovered by the young girl. Where's the best vantage point? : All of the sequences on the viaduct top are quickly identifiable, and the camera positions from the original shoot can easily be replicated. What about access? : The viaduct is open to the public and there are no photographic restrictions. However, each of the possible routes to the viaduct top involves steep climbs, and the pathways need to be traversed with care. Anything else? : Of all the locations in Monsal Dale, the top of the viaduct is the most popular with tourists — for obvious reasons. The viaduct is at its emptiest during weekdays, in the early morning and early evening, and "out of season". The wooden hut in which Charles and Fenton shelter no longer exists, but stood just to the left, on the other side of the fence line.